Will Climate Change Cost the Earth? 01:09 - What can we do to stop the Ebola spread? How much of a threat is Ebola, and what can we do to stop it? We put your questions to Dr. Chris Smith. What can we do to stop the Ebola spread? Ebola cases have now been confirmed in Europe and America. A nurse at a Madrid hospital treating two infected missionaries herself contracted the disease, while in Dallas, a man who caught the virus in his native Liberia has since died. Kat - So Chris, give us a quick top down. What is Ebola? Where did it come from and how is it spreading? Should we just be panicking and putting on masks everywhere? Chris - Ebola is a virus, Kat. It has been around since the later 1970s. 1976 was when the first human case was recorded but there were certainly cases before that. Periodically, it's caused little outbreaks of a few hundred people at a time. So, this outbreak which is happening ever since probably we think December last year, the index case was a young 2-year-old boy in Sierra Leone last December based on genetic studies. This current outbreak will therefore be at least equivalent to all of the deaths of all of the previous outbreaks of Ebola in the last 40 years. So in other words, it's a massive departure and it's very unusual. Kat - Now, I've heard people describe Ebola as a zoonotic virus. What does this mean? Does that reflect where it's coming from? Chris - Yes. So, about 75% of what we call emerging infections which are infections that haven't previously is circulated in humans, but have now got into humans. About 3 quarters of them come from an animal reservoir. In other words, they're naturally an infection of a wild animal and through some mechanism which can vary, they get out of that wild animal and they jump into humans. Now because they're well adapted to living in a wild animal, they're not well adapted - these viruses - to living in humans. They tend to make us much sicker than the wild animal host which is why the animal that naturally carries Ebola which is some species of fruit bats, they can carry it without becoming unwell. But when it gets into a human, it's a massive case of overkill and about 70% to 90% of people who become infected will die. Kat - Now, we've had a couple of questions in on Twitter. We have something from fullcircle man who says, "Are there more virulent zoonotic viruses out there in nature that remain undiscovered and should we worry about them?" Chris - Well, we don't know yet, but it's a very good question. The thing is that if you look at what's probably provoked the present Ebola outbreak, a paper from Simon Hay and his colleagues at the University of Oxford which was published last month in eLife showed that the mechanism is almost certainly down to population and communications. We've now got 300% plus more people living in the areas where the Ebola outbreak has happened than historically. There are much better roads in communications and this means that people are more likely to come into contact with wildlife and once they catch an infection, they're much more mobile, so they're more likely to spread it. This also means that if there are other nasty viruses lurking out there, we're more likely to come into contact with them as the population grows and there's more pressure on the environment to build houses and feed people. So, farmers move into virgin rainforest, houses get built on virgin rainforest, and so on. So, we don't know what's lurking out there yet. But if you look at the last 10 years or so, we've had the SARS epidemic and that became a pandemic, and SARS was a natural infection of bats in China. We've also had an outbreak a bit before that of a disease called Nipah virus which again was a bat virus that got into pig farmers in Malaysia. So, who knows what's lurking out there but we really have to be careful and all actually comes down to population. Kat - I remember the MERS one. I think that's a camel one. In this month's Naked Genetics podcast that's coming out on Tuesday, I'm looking at the bat flu virus genes that researchers have been studying. A couple more questions. We've got Stuart Degrut says, "What about the outbreak in Europe? Isn't it pretty hard to get infected with Ebola? How are these healthcare workers becoming infected here in Europe and America?" Chris - If you look at the rate of infectivity of things like Ebola, it only takes between 1 and 10 virus particles to infect a victim. But that does require close contact. You need to get the virus into a mucus membrane. In other words, around your eyes, into your mouth - that kind of thing - or into damage or a breach or abrasion into your skin. So, if we look at the cases that have happened in developed countries, the nurse in Spain who caught it thinks that despite the fact she was wearing protective gear, there was probably enough virus because a person who's infected with Ebola will therefore have effectively an entire world infecting dose inside them because they will have billions of viruses in them and all the secretions that leave the body, all body fluids including vomit, diarrhoea and so on, which are symptoms of Ebola. If that gets on to a piece of protective clothing, but then you touch the piece of protective clothing, the virus can go onto your skin and if you then rub that into a mucus membrane such as into your eye, put your fingers in your mouth, or you have a small cut or abrasion to the skin, it can go in and then it can infect you. Kat - It is absolutely terrifying to me anyway. A question from Matias Tula, "How far are we from a vaccine or an effective treatment - 6 months, a year?" Where are we going to be with this because this does seem like a crisis basically? Chris - There are two vaccines currently being trialled. One is from GlaxoSmithKline. They're actually developing this and doing this in a human trial in Oxford. Animal test of the same platform or technology had been very effective. What they're doing is they've taken a virus that normally causes the cold in chimpanzees. They have stopped the virus from growing. So basically, it can only act as a sort of virus coat to carry Ebola coat genes into a person. 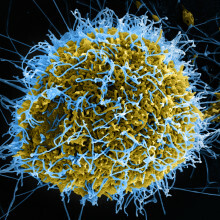 This shows the immune system what Ebola looks like, making them make antibodies to Ebola. They have now got that going into people as a phase I trial. We'll find out whether that works. It does work very well in animals. There's a similar technology being done by a company in America called NewLink and it's been developed by Canadian academics, NewLink developing it. But both say it will take several years before we a.) know how effective it is to get the right sorts of numbers, b.) to make enough of it to stem the current outbreak. We're talking about needing probably a hundred thousand doses and we're nowhere near having that much yet. Kat - Well, you can read more about Ebola on our website that's https://www.thenakedscientists.com/articles. Kevin - I left the lab on a Friday night and I was a bit lazy, I didn't clean-up. When I came back on Monday, there was an extraordinary sight. I had a few flasks with different yeasts on my bench. One yeast was producing way more of this aroma compounds because we genetically modified it so that we over activate the aroma gene. One didn't produce any aroma compounds at all and the other one was a normal yeast. There's a fly genetics lab right next door and somehow, some of these flies had made their way into my flasks and they were quite picky. 50 flies made their way in the high aroma flask and only two of them made their way in the normal yeast and none of them chose the flask that contained this mutant that doesn't produce any aromas. So, that of course got me thinking. Maybe the yeast makes these aromas to attract flies. But that's a nice hypothesis, but it's not so easy to really scientifically prove it. And it's taken quite a few years more specifically until I met two neurobiologists here working at the University of Leuven. So, they had all the expertise to look at this problem from the fly side. So, we worked together to setup experiments where we could really study how flies respond to a different yeast and their aromas. In a nutshell, what comes out of it is that, clearly, the yeast's aromas are attracting flies and the flies then, when they're attracted to the yeast, they will eat some of this yeast but they will also carry a few of the yeast cells to different places. They will fly around and yeast cells sort of hitch a ride to the - they're kind of using the flies as a taxi. Georgia - Are they tricking the flies or is there something to be gained for the flies as well? Kevin - They're luring the flies with aromas. So in one way, you can say, "Well, that's very smart for yeast cells." But of course, the flies also like yeast cells because they eat them as a protein. So, as fruit flies, we think usually eat fruit, but fruit doesn't necessarily contain enough protein for them especially when they need to lay eggs. For the yeast cells, it's really important to go to other places. I mean, they don't have any legs or wings so they can really move around. So you have to imagine being a poor yeast cell sitting there on maybe a grape where you pretty much depleted all the sugars and there's now millions of yeast cells, but they don't have anywhere to go to, or they don't have any means to go there. So, maybe you want to sacrifice a few of your brothers and sisters just to go to a new grape where you can start eating again and growing it. Georgia - These aromas that the yeast is making are ideally, you said the flies will come and transport them around so they can continue to grow and survive. And then humans come along and decide we rather like them too and start drinking lots of beer. Are we sort of ruining this process for the yeast? Kevin - Well, not really because beer is not really a natural product. I don't think we're disturbing the ecosystem too much. But it's true that we really love these flavours and I know that most consumers won't necessarily think of bananas when they're drinking their beer. But trust me when you would take away these flavour compounds, these yeast derived flavour compounds from beer, from wine, you would end up with a very bland and not a very tasteful product, one that frankly, you probably wouldn't want to drink unless you're a desperate PhD student perhaps. They drink anything. I've seen it in my lab. So, it is true that we like these flavours and it's not a coincidence because these flavour compounds are literally chemically identical to the flavour of compounds that fruits produce when they're ripening. So, it's kind of maybe logical that we as humans are also attracted to them because they're also nice food for us. Georgia - Now, you found these genes and you can turn them off and turn them on. Are there any practical applications for what you've discovered here? Kevin - With those, we can already make quite good beer, but we can make it even better. One of the things we're doing is we're breeding yeasts now to make even more flavours because in the process of this research, we effectively slaughtered quite a number of flies and we've isolate the microbes that are growing on them. So, there's lots of different yeasts on there. All the microbes you find on these flies produce aromas. Now, some of them produce way more even than your typical wine yeast. So, one of the things we're doing now and have been doing is taking some of these and breeding them and seeing if they're useful for beer making. And we've also been taking normal beer yeast and literally crossing it with some of this more exotic yeasts to get better yeasts that make more aromas. It's working out quite well. We've actually sold some of these yeast to breweries and they're making really nice beer with them. Kat - That's Georgia Mills talking with Kevin Vestrepen who's presumably going out for beers with his desperate PhD students to celebrate their publication in Cell Reports. Chris - Kat, got a tweet here from Chris Coney who's tweeted @nakedscientists, "Why does fungus grow so close together?" What's the answer? Chris - Because they don't need mush-room. A Swedish truck driver has become the first person to receive a new design of prosthetic arm that is mounted directly onto the bone in his upper arm and is controlled by electrical signals picked up from nearby nerves and muscles. Touch sensations from the artificial arm itself can also be sent back into the nerves that would have picked up sensations from the patient's missing fingers, restoring a sense of touch. All of this information is carried inside - and through - the metal arm implant, so there are no external wires or holes in the skin, which minimises the risk of infection. Chalmers University of Technology researcher Max Ortiz Catalan is leading the project. Max - There are basically two main problems when it comes to prosthetic devices today. One of them is how do you attach the artificial limb to the body. The second one is how you get the patient to control their prosthetic device. We solved the problem of the mechanical attachment with putting a titanium implant inside the bone and the bone cells will grow very tight around it and anchor it. And that gives you mechanical stability. So, the prosthesis is fixated to the bone. Chris - I see. So, you've effectively got a very strong anchor point which comes out at the end of wherever the bone has been severed or cut-off and this then provides you with a firm attachment that's rigid. It's not going to move, so you've got strength there. What about the other problem which is, if you're using one of these prosthetics, you need to be able to control it in all these degrees of freedom, given how many different directions of movement a functional arm has? Max - For a long time, people has been thinking about implanting electrodes. So, you go directly to the nerves and muscles and get the signals from there. That also could leave with a possibility that if you're connected to a nerve for instance, you can send electrical pulses. So, the patient can perceive sensory feedback that's coming from the missing limb. So, we used this anchoring point as a feedthrough mechanism. So, we embed connectors inside the implant. So, these signals can go and come between the prosthesis and the person using this anchoring point. So, we have mechanical attachment but also, communication between the control system of the prosthesis and nerves and muscles. Chris - So, what? 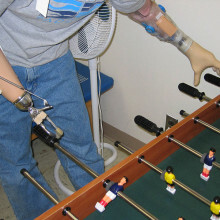 There are little wires which run through the anchor point so they could carry signals out of the prosthesis and feed them into nerves in the stump so the person could feel what's going on and you can also pick up signals from the muscles around where the implant is, enabling the person to control the prosthesis downstream. Max - So, it's a little bit more tricky than wires running inside the implant, but it's a series of mechanisms because we have sealing compartments to avoid bacteria to go in and so on. Chris - What about controlling the prosthesis and also, giving the person who's wearing the prosthesis feedback about what they're doing, what they're touching, and how hard they're pressing on something for instance. Max - What we can do now because we have electrodes in the muscles and around the nerves is record signals that are travelling from the brain and that will normally go to the missing hand and use those to tell the prosthesis what to do. In a similar way, because those wires that are the nerves that are going to the brain are sealed there, we can still send electrical impulses and the person can perceive different sensations depending on how you're stimulating or which fibres you're stimulating. Chris - How do you collect the electrical signals which are going down those nerves or present in the muscles in order to then transmit them into the prosthesis? Max - So, we have electronics that amplify the signals from the nerves and the muscles and then we take that information and reduce that information with algorithms to predict what is the person trying to do because we know what the person is trying to do because the person is telling us. So, in that way, we can correlate how those signals look like and then translate that into the motion the patient is intending to do. Chris - And then you feed those signals into the arm itself. How long does it take for a patient who receives one of your implants to actually get used to using it? Max - It's very straightforward. The patient basically needs to remember how he was using the hand before. So, how to contract the muscles in a way that it used to be when he had an arm and then the system will work. Chris - With Max is the patient who has received this implant. Hello, Magnus. Chris - Tell us a bit about you. What do you do for a living? Magnus - I'm a truck driver for mining. Chris - How did you come to meet Max? Magnus - I got a tumour in my arm, so they asked to cut it. Chris - What did you then do? Did you just get a prosthetic arm straightaway? Magnus - I was one year without arm. Chris - When you did get a prosthetic arm, what was it like? How did you cope? Magnus - It was really bad. It was not so comfortable. Chris - What was the problem? What did you find was difficult? Magnus - The arm was heavy and when it's warm outside, you get sweaty and it was difficult to work. Chris - What sorts of tasks did you find tricky with it? Magnus - I couldn't lift heavy things. I couldn't lift the arm in every positions. Chris - Could you do your job? Magnus - No. I couldn't work. Chris - You then get fitted with this new device. How did that make a difference? Magnus - I can work 100% and it's more like a real arm, not like a tool. Chris - Max, in this device, you must be delighted. Max - This is why I'm in this business really. Technically and scientifically, it's very interesting and appealing, but it's also very rewarding. And something that has to be said about this is that it was a close collaboration between the technical side that's Chalmers University of Technology, but also the hospital. Without the medical and the technical working together as well as an industrial partner because you need to have the regulatory system in place to be able to produce an implant that you're going to put inside a person. If you take one of those three components out of the equation, this will not happen. Engineers cannot do it alone. Doctors cannot do it alone. So, it's been a very nice collaboration. Kat - That was Max Ortiz Catalan and before him, Magnus Niska and their work appeared in the journal Science Translational Medicine. A younger galaxy might hold the key to solving the mystery of light in the universe. When we look at very distant clusters of stars in ancient galaxies "far far away" across the Universe we can see light coming from them which has been travelling for literally billions of years to reach us. But theories of how the Universe - and the first galaxies - actually formed suggest that these stars should be cloaked in dense clouds of gas, which should have soaked up the light, blocking its path. So how did this light nonetheless escape to still reach us? 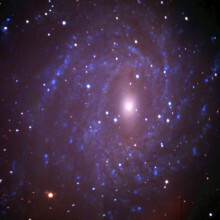 Well, a younger, much closer galaxy might hold the key to solving the mystery. It's very compact and rapidly forming new stars that are - relatively speaking - also very close together. This produces a powerful wind that can literally blow holes in the gas, allowing light to escape. And because we think this galaxy bears a very close resemblance to the earliest galaxies in the Universe, this could explain why we can see them too. Sanchayeeta - Our discovery is that we found ionising radiations. So that is the radiation that can ionise hydrogen, escape out of this galaxy. And this is basically important because it provides a viable and very likely scenario for how the young stars in the very early universe were able to get their ionising photons out. Kat - This galaxy that you've study, how far away is it? Sanchayeeta - Well, this is a nearby galaxy and it is just 3 billion light-years away. Kat - That still seems quite far away to me. Sanchayeeta - Well in astrophysical terms, it's just like looking something really nearby. Kat - Paint me a picture of this galaxy. What's it like and what makes it able to give out this high energy? Sanchayeeta - So, this is a special galaxy in the sense that it is forming a lot of stars. But more than that, it is forming all the stars in a very compact region. Say, this producing about 50 solar masses of stars every year. It has a billion solar masses of stars in about 300 light-years. And because of that, the combined effect of all the young stars, they generate winds. The winds together are so powerful that they can sort of blow out parts of the clouds, create these gaps and then through these gaps, the ionising photons really stream out of the galaxy. Kat - I guess it's a bit like when you look up at the sky and it's a sunny day, but there are clouds, and you see the sunlight streaming through the clouds. Is it that kind of effect? Sanchayeeta - Yes, it's exactly that kind of effect. Or rather on a cloudy day, only through the parts of the sky where there are these gaps, you could see the sun shining through. So, what we want is to find these holes or the gaps in the cloud cover. And this is one of the examples how the galaxy is able to create the gaps through which the light can sort of just really stream out. Kat - What do your results tell us about the formation of the early universe? Sanchayeeta - The earliest galaxy we have discovered so far, it is a very compact star forming galaxy. It has similar properties. The size of the galaxy is very similar. It is forming similar amount of stars and it has similar amount of stars already. So, it's look like, if you look at this galaxy that we have in the nearby universe, this is what it would look like. And that's why we think that we can translate what's going on in this galaxy. And that is that it's so massive and so compact that together, it can really create havoc on the parent cloud and create these gaps, and let the ionising photons escape. 23:31 - Nobel Prizes stripped bare! 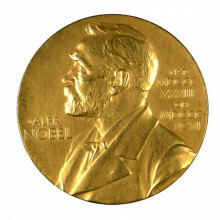 The latest Nobel prizes have been announced, but who won them and what for? Chris - This year's Nobel Prize winners have been announced. Nobel Prizes recognise world changing achievements and here to take us through this year's crop of science prizes is the Naked Scientists Amelia Perry. Hello, Amelia. Chris - So, let's start with medicine because there's three subjects to cover - medicine, chemistry and physics. Let's start with medicine. Who got that and what did they get it for? Amelia - So firstly, John O'Keefe from University College London and a Norwegian married couple, May-Britt and Edvard Moser. This trio won for unpicking the workings of the brain's internal GPS system. This can allow us to answer questions such as, "How do I know I'm in Cambridge right now? 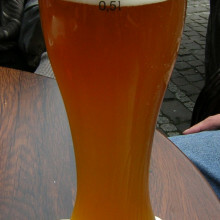 How can I find my way to the local shops or the pub more likely?" and "How can taxi drivers memorise all the streets in a big city like London, without cheating and using a satnav?" Chris - So, how do they do it? Amelia - So, back in the 1970s, O'Keefe discovered nerve cells within the brain that are selectively stimulated when we move into a specific position within our 3D environment. He aptly the named these 'place' cells. More recently, the Mosers discovered 'grid' cells which almost act like the lines of longitude and latitude within our brain, forming a coordinate map that makes the basis of our navigation system. This is of great importance for diseases where this goes wrong such as in Alzheimer's where individuals often get lost and can't recognise their environment. Chris - Terrific! So now, I know how to find my way to do the show each week which is very encouraging. What about the chemistry prize? Who got that and what for? Amelia - So, one German scientist, Stefan Hell and two US scientists, Betzig and Moerner. These guys won the prize for making the previously invisible visible. So, light microscopes, they've been around for centuries dating back to the 1600s using lenses and visible light to allow us to look within the cells of our body. However, there is a limit to what they can see, due to the so-called Abbe limit. And this means if we want to look at smaller structures within our cells, smaller than the wavelengths of light itself, we have to resort to destructive techniques like electron microscopy which kills the cells. Chris - Which is not terribly useful for watching what's really happening on living cells. So, how did these people get around the problem? Amelia - So, using a special trick using a naturally fluorescing glowing chemical and switching on and off using a laser, they can illuminate tiny parts of the cell, much smaller than a light microscope could do. This allows us to see in much greater detail, allowing us to peek into the 'nano-world' and observe cell processes that have previously been described but never before seen. Chris - Talking about shedding light on things, the physics guys got the prize for blue LEDs, didn't they? So, why is that important? Amelia - Red and green LEDs have been around for decades, but blue has been far trickier to manufacture. This is because they needed to find a material that can emit the wavelength of blue light, which is at the very high energy end of the spectrum, when electricity is passed through it. They discovered a material, gallium nitride, that can do this, and when we combine red, green and blue, we can get white light. This is found within our tablets, our smartphone screens, computer screens, televisions, and it's even making its way into lighting our offices and homes. 20% of electricity costs within the UK actually go towards lighting and LEDs have the potential to halve this as they're much more efficient. Chris - And that shows you why it's such an important discovery. You better name them so that they're not left out. Who were they? Amelia - Isamu Akasaki, Hiroshi Amano, and Shuji Nakamura. Chris - Well said Amelia Perry. Thank you very much for joining us. Kat - So, explain to me, what exactly is climate change? What does it mean when we use these words? Emily - Well, as you say, we've been seeing signs of disruption to our climate system in the melting of glaciers, the decrease in the amount of sea ice particularly in the Arctic, in the rising sea level and in rising temperatures. So, we've seen over the last century nearly 1 degree centigrade temperature increase. When you take those different signals together, we see a collective picture of a changing climate and that's what we mean when we talk about climate change. Kat - So, I mean, we sometimes hear things when we get particularly savage winters. People go, "Well so much for global warming." But explain to me how overall the world can be warming, but the climate in different places can be changing in different ways. Emily - The last few winters, we've had a number of occasions when there've been particularly cold winters. In the UK, there was one year recently when Heathrow was disrupted because of abnormal snow conditions for example. But that was due to a shift in weather patterns at the same time as it was particularly cold here in the UK. It was actually abnormally warm in parts of Canada. So, whilst you can have different weather conditions due to shifting weather patterns in different parts of the world, what we're seeing overall when you average across the whole of the globe is a steady warming trend. Kat - So, you mentioned overall being able to see this warming trend. What is the evidence that we have that the climate is changing? How can we trust that this is really happening? Emily - So, I think the key question is, how do we know that humans are influencing this change? And we have seen a steady increase in the amount of carbon dioxide in the atmosphere since the start of the industrial revolution. The carbon dioxide levels are now about 40% higher than they were at the start of the industrial revolution. And we know that that is predominantly through the burning of fossil. And so, it's through that that we can link human activities to the change in the composition of the atmosphere. We then know that the greenhouse effect kicks in. If you increase the amount of carbon dioxide in the atmosphere, that changes the energy balance of the Earth and results in warming of the surface of the Earth and they are the knock-on effects in terms of the disruption to the climate system. Kat - So, we see sort of climate predictions where people say, "Well, it could go as far this or maybe just as bad as that." Paint me a couple of pictures, maybe a sort of worst case scenario of how bad things could be and then maybe a kind of consensus scenario of where we think we'll be in maybe a few decades time. Emily - So, the concern is that if we continue emissions of greenhouse gases at the current rate then we might exceed 4 degrees temperature increase by the end of the century. Now, what does that mean in terms of our daily lives? Here's just one example - it might mean that we see up to 1 meter of sea level rise. That increase in temperature has a significant knock-on effect, not just in terms of human lives, but then also on all ecosystems and critically, it also raises the risk of severe, abrupt, and irreversible changes to our climate system. Another sort of example of how those temperature increases can affect everyday life - Uganda's top earning export is coffee and at the moment, large sections of the Ugandan countryside are ideal for growing Robusta coffee. But if we saw just a 2 degree increase in temperature then that coffee production would be decimated. Kat - I guess as soon as the politicians in Westminster see it flooding and can't get coffee, they might start to pay attention. But very briefly, can you explain to me a little bit - you mentioned CO2. How can we project? 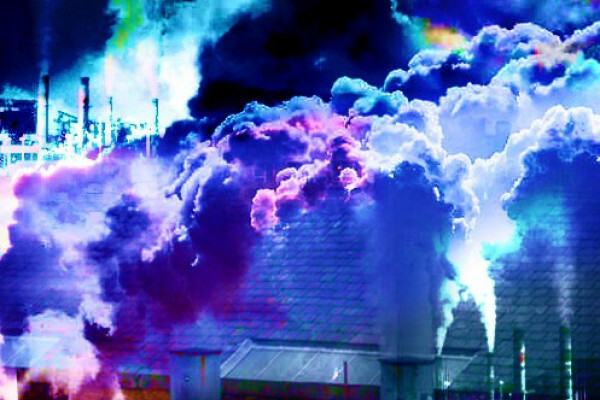 What are the projections for how much CO2 we can afford to release and I guess this is an issue for business about what we can afford to be burning in the near future to avoid these kinds of catastrophic rises. Emily - So, the science says that we can burn no more than a total of a trillion tons of carbon if we want to avoid going above 2 degrees temperature increase. 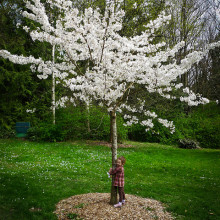 To date, we have already burnt 70% of our carbon dioxide allowance of that. Now, if we look at the total current proven reserves of fossil fuels, the consequence of that science says that two thirds of our current proven reserves of fossil fuels are effectively unburnable if we don't want to increase our temperatures above 2 degrees. And 2 degrees is the level that's considered to be avoiding dangerous levels of climate change. Kat - And I guess briefly, that does have quite big knock-ons for businesses and how they're projecting in the future, where they're getting energy from. Emily - It does and just the current value of that unburnable carbon is about $20 trillion dollars. Kat - Dr. Emily Shuckburgh from the British Antarctic Survey. Thank you. There will be many financial costs (and benefits) associated with tackling climate change, but how can these be predicted? Chris - So, how much might climate change cost businesses then? Doug - Well, the first thing I want to say is that there's a difference between what it costs the businesses and what it costs the economy. So, if for example, I'm the CEO of Tesco. It might cost me a certain amount of money in Tesco, but if I'm George Osborne, what I'm really interested in is GDP. So, our estimate is that under the worst scenarios of climate change, at least the economic systems are being hit at the level of 2% to 3% loss in GDP, but some businesses will do quite well under that. They're the ones replacing buildings and so forth. Other ones are taking terrible hits. Chris - To a certain extent, do they not just pass the costs embodied in a more expensive industry straight onto the customer? So that means that whether we like it or not, we're all going to be paying more because of climate change. Doug - I think probably ultimately, that will be the answer. Chris - So, how does someone like you, when you're trying to do sort of mitigation strategies and so on, how do you actually put climate change concepts and predictions into tangible financial terms that will mean something to policy makers, governments, and the person in the street? Doug - It takes place in two stages. One is mitigation - so, those are estimates of how much it's going to cost to reduce the threat of climate change to the level that Emily was speaking about just a moment ago. So for example, if we say that there's $80 trillion US dollars a year flowing around in the global economy, we think, in order to hit the targets that Emily is speaking of, we can perhaps dedicate 1 - 2% of that GDP to mitigation efforts. Chris - But if we're spending that on mitigating climate change, it's not being spent elsewhere, is it? Which is Peter that we're robbing to pay this Paul? Doug - It's that statement in particular that I'd like to sort of put a line under which is that the money doesn't disappear for spending it on mitigation. It isn't simply being burned. It's going elsewhere. So, if one looks at what the cost is, it might be a few percent of GDP going in, but that few percent is not actually being lost. In fact, if you use the projections from Cambridge Econometrics in the Cambridge area here, you find that it results in a 0.8% increase in GDP globally. Chris - Are there also some counterbalancing positives? So for instance, if I disincentivise people to burn coal and this improves air quality then I end up with fewer people with asthma or an exacerbation of chest problems. So actually, my doctors are less busy, my A&E department is less saturated, I save money there. Can one offset some of the benefits of the spend on mitigation in terms of health gains? Chris - With other direct benefits. But of course then, there's the - what about the indirect benefits of, if we do prevent the climate changing, we're not going to get the costs of a changed climate which could be an additional burden, couldn't they? So, it could be even bigger numbers. Doug - Well, in the estimate, the current best estimate, although these are really weak estimates at the moment, is that the direct climate impacts roughly of the size - what I just mentioned - for the co-benefits, 100 billion let's say, per year, US dollars being saved. Chris - But these are not huge numbers that we have to spend to achieve quite big differences. Doug - No. There are 1 - 1.5% of global GDP in order to make these changes. I mean, we spent much more than that in the UK on bailing out the banks. Chris - How long do we have to exact some of these changes? Doug - Personally, I would say that we have perhaps another 5 years to really get serious about the reductions and put in place the financial measures to solve this. Chris - So, that's not long. Doug - No, it's not. It's very short compared to what usually occurs. Chris - How many times we've missed the Kyoto deadline? All those stipulations laid down and people say, "We're nearly there." We never quite made a lot of the time. Five years is not very long, is it? Doug - No, it's not. Remember I said it's 5 years to get started on it. We've got until 2015 to solve the problem let's say, but if we wait until 2049 at midnight, we're not going to be able to solve it in the 30 minutes remaining in the year. We have to have a steady decline between let's say, 2015 and 2050. Chris - Sobering words. Doug Crawford Brown from Cambridge University, thank you very much. Roman - Normally, we think of climate change as something that needs technological scientific solutions, but try and think about it through the lens of empathy. I mean, 98% of us have the ability to empathise, to step into other people's shoes, wired into our brains. And climate change can be seen as a problem of a huge empathy deficit. We're not putting our empathy into practice in two ways. We're failing to step into the shoes of people in developing countries who were being hit by extreme weather events related to climate change. We just heard about Anneil there in Bangladesh being hit by floods. And equally, we're failing to step into the shoes of future generations. What's it like to be a teenager living in Dublin or Dubai in 2100 in a climate changed world? Unless we can make that empathic leap, we're not actually going to create the kind of grassroots social movements, the kind of political action, that is required to push the politicians to come to new global agreements. Roman - I'm sorry to say that all those cute polar bear pictures haven't actually been very good at galvanising people over the last few years on climate change because the social science research tells us that actually, what motivates us is caring about other people more than plants or animals. That's the reality of it and there needs to be much more campaigning about trying to give a human face to the people whose lives are being affected by climate change today and in the future. Kat - One of the things that we see a lot is on social media, things like Facebook. 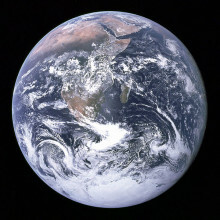 Lots and lots of people sharing pictures and saying, "Save the Planet". Is social media actually going to help us evoke this empathy and desire to do something or is it just people scrolling through, clicking, clicking? Roman - I think social media is a double edged sword. On the one hand, there's a lot of 'slack-tivism' rather than activism around people clicking in online petition, thinking that's genuine political action. but we also know that organisations like 350.org or the Climate Outreach Information Network in the UK have used social media to get tens of thousands of people onto the streets. Just a few weeks ago, 162 countries, there were climate change protests, nearly 50,000 people in London, over 350,000 people in New York. When you look at human history, you don't get big political change, action on climate change or the movement against slavery in the 18th century, you don't get that without there being mass social action, collective action. So, at the same times as we need to insulate our own homes, we do have to get out onto the streets and make our voices heard. Kat - So if there was one thing that you think could increase empathy that you would want to see tomorrow, what would it be? Roman - I'd like to see every school class in Britain having a twin link up with a school class in a country being hit by climate change today, whether in Kenya, or Uganda, or Bangladesh so that we actually have conversations with people in other countries which actually open our eyes to the realities of how climate change is affecting people's lives right now, today. Kat - Thanks very much. That's Dr. Roman Krznaric from the School of Life London and author of Empathy: A Handbook for Revolution. 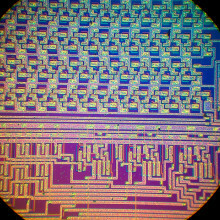 Computers account for between 2-6% of global CO2 emissions, but can energy-efficient microchips help? Chris - How many aspects of our lives are ARM involved in? Dominic - Well, the vast majority really, although it's a company that many people haven't heard of. So, you think you have things like Blu-ray players, digital cameras, 95% of mobile phones, but also things like the majority of air bags, car breaking systems, even things like pacemakers, smart meters, credit cards all have our technology within them. Chris - And this is because it has the capacity to save energy in some way. Dominic - That's not initially the reason why people are using ARM, but of course, the fact that we are very, very energy efficient is becoming more and more a driver for our business. So, initially, it was because mobile phones have batteries. Batteries have to last a long time. But now, we're creating products like the Cortex-M0 Plus which is smaller than the width of a human hair and can run for 10 years on a single watch battery. And this kind of technology is going to revolutionise our sensing systems. And of course, it's sensing systems that can then provide more data and using that data, we can then run everything much more efficiently. Chris - This also presumably means that you could put sensors into remote places and just mop up free energy, I say 'free' in inverted commas, but basically waste that's either vibrations on the wind or some heat that's just latently in a piece of building fabric or something to run things. Dominic - Well, energy harvesting is part of it. But really, if you're looking at how we can create a much more efficient world. So computer chips are accredited with achieving about 23% improvement in our energy efficiency that we run everything over the past 30 years. In essence, that was a by-product, that wasn't deliberate, that just happens to happen. If you look over the next 30 years, it's becoming much more of a key focus for all the designers of technology. And so, if we make it a key focus, it's predicted that we might even save as much as 60% of energy between now and 2050. Chris - It's a big spend, isn't it? I mean, if you look at the interview with the guy who currently is in charge of GCHQ, their super computer in the basement of GCHQ burns off more electricity than the nearby town. You must be a breath of fresh air for them. Dominic - So, ARM has just started to design chips to go into servers. At the moment, a data centre tends to - its carbon emission, it's energy consumption tends to go 50% to the servers themselves and 50% to cooling. Recent tests on some of our early ARM prototypes have suggested they might run on 1/10th of the power and require far less cooling. But certainly, data centres are a big issue. They're expected to triple between now and 2020. Chris - Why are these chips so inefficient? Dominic - The focus for a very, very long time has been to create a technology that is as powerful as it can be. So, it's been focused on power rather than on energy efficiency. But we're getting to a point now where it's arguable whether we really need chips to be more powerful. They can do the data analysis, they can run social media, they can do the things we want them to do. So, it's becoming much, much more important that they use less and less energy and that's where ARM comes in. Chris - Now, what about the third world. The population estimates were revised a couple of weeks ago by researchers in Canada that we may be looking at a 2050 world population of upwards of 10 billion maybe even 12 billion. Most of that growth is countries like Africa. There, you're going to see a very big embracing of this sort of technology and at the moment, in countries like Africa, people would rather go without their lunch, than go without a charge for their mobile phones. 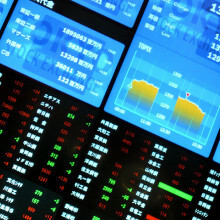 So, you must regard this as a huge opportunity in a massive market. Dominic - It's certainly is a huge opportunity. I mean that in a very good way because I think it's a great opportunity for people in those countries as well. So, a lot of the discussion earlier in the programme suggests the great damage and the risk that's created by climate change in these countries. And of course, that means that things like water and food, agriculture, will have to be managed much, much better. The internet of things isn't just about smart cities and first world problems. It's also about managing water, agriculture and the growth of food in developing countries. So, one of the projects we're supporting at the moment with the charity and alongside UNICEF, is a very simple sort of mp3 player that can run on for a year on a local Ghanaian battery and it's filled with local content in the local language, and given to illiterate farmers and illiterate communities to help grow their crops more efficiently. Initial trials show a 50% improvement in crop yield. So, very significant. So, we can use technology to help mitigate some of the issues around climate change - use all our resources more efficiently, manage a global population of 9 or 10 billion people. And all the forecast suggests that whilst obviously, IT does absorb power, it needs power, it's going to emit carbon. If used effectively, it can actually - the amount of power used, the amount of carbon emitted - will be significantly less and the savings it can create. Chris - Dominic Vergine from ARM, thank you very much indeed. 50:07 - How can I avoid being struck by lightning? Achmed - I was struck by lightning twice while I was on the telephone. On both occasions, my ears were ringing for days and the pain was excruciating. What I wish to know is, was I just unlucky or am I prone to attract lightning? Is there anything I can do to protect myself in the future? Timothy - To find out the answer to Achmed's question, we spoke to John Jensenius, a lightning safety specialist from the American National Weather Service. John - In the initial stages of a typical lightning flash, a charged channel develops downward from the thunderstorm cloud toward the ground. That channel is not attracted to anything. But approaches the ground blindly and tends to strike the tallest object in the immediate area. Once a connection is made with the ground, a brilliant flash that we call lightning occurs as charges are dispersed to the area surrounding the contact point. Timothy - In other words, lightning happens when the electrical charge that is built up in clouds instantly discharges and hits the ground, a building or in two cases, Achmed. But is Achmed actually prone to being struck by lightning and was it something to do with him holding a phone. John - You are not prone to being struck by lightning nor is your phone. Metal objects and wireless phones do not increase the chances of being struck. However, I should point out that the question of whether you're lucky or unlucky is debatable. It is certainly unfortunate that you were struck twice, but you are lucky to be alive and not seriously injured. Timothy - So, every cloud has a silver lining, but what actually happens to your body when you get struck by lightning? We went to Dr. Hugh Matthews, a reader of sensory physiology at the University of Cambridge. 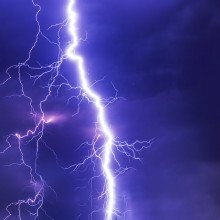 Hugh - If you get struck by lightning, the highest strength or voltage normally leads to most of the electric current flying past the surface of the body. Something called a flashover through the air as this means that the lightning can reach the ground more easily. The surrounding air gets hotter than the surface of the sun which causes a thermoacoustic blast wave. When this happens a longway away, we call it thunder, but when it happens right next to you, it can burst your eardrums or throw you to the ground, breaking bones. Timothy - The fact that Achmed ears were ringing for days was due to this thermoacoustic blast wave even though most of the current doesn't flow through the body, it's still a serious problem. Hugh - The biggest risk from lightning is disruption of the electrical signals which coordinate the heartbeat. This can lead to cardiac arrest. The electrical current can also stop you breathing by paralysing the chest muscles and disrupting the groups of nerve cells in the brain which control breathing rhythm. It's also common briefly to lose consciousness due to the immediate effects of the electric current on the brain. Timothy - Assuming that you wouldn't like to lose consciousness from electrical currents on the brain, John told us what to do next time there is a storm brewing. John - If you want to be safe, you'll need to get inside a substantial building or a hard top metal vehicle any time a thunderstorm is in the area. Remember, if you can hear thunder, you are close enough to be struck. When thunder roars, go indoors. Timothy - Thank you John and Hugh for your illuminating answers and good luck Achmed in avoiding any future lightning strikes. Next week, we'll be leafing through the literature to find out the answer to this question which was written to us by Amelia from London. Amelia - Why do leaves turn red in autumn and how do they know when it's time to drop? Chris - And if you know the answer to Amelia's question, you can email chris@thenakedscientists.com, you can find us on Facebook or tweet @nakedscientists. There's also our web forum, thenakedscientists.com/forum. You can join the discussion there. That's it for this week. Thank you very much to Hannah Critchlow for her help with the production. Next week, we'll be continuing our future of humanity series. What will our cities look like in a hundred years' time? will people be living in the skies or underground, or we make our escape to the country? Thank you for listening and do join us at the same time next week. Goodbye. Next How can I avoid being struck by lightning?